The introduction of the new ‘Boiler Plus’ legislation will see a rise in the demand for energy saving measures. Sean Keleher – National Technical Manager at ATAG Heating Technology – outlines the benefits of one that is already on the market and relatively well established. When the Department of Business, Energy and Industrial Strategy (BEIS) announced the new ‘Boiler Plus’ regulations, the entire heating industry was put on notice to adopt and embrace a number of energy efficiency technologies as standard. From 6 April 2018, when a gas combination boiler is installed in a domestic property in England, it will be mandatory to install an additional energy efficiency measure at the same time. One of the technologies that can be used to comply with the new standards is the flue gas heat recovery system – enabling heat from a boiler that would otherwise be wasted to be reused. However, for an innovation that has been around for over a decade, awareness of the system benefits and understanding of the technical processes involved are still very low among domestic boiler installers. Installers play a critical role as an advocate and promoter of the environmentally-friendly energy efficiency mission. 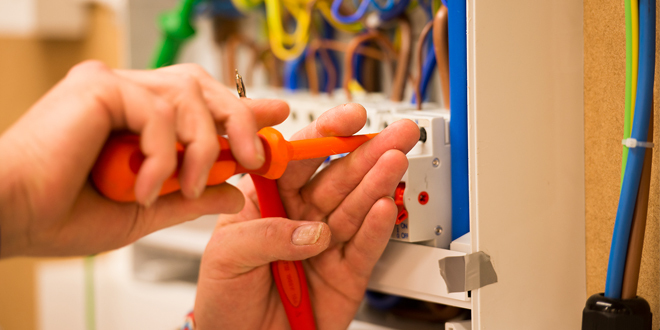 Yet it is clear that more industry training and promotion needs to take place to educate installers about the system solutions, and the efficiencies that they will bring to their customers – which include reduced gas consumption, improved domestic hot water efficiency and gas bill savings. The first version of a domestic heat recovery system was the GasSaver, produced by Zenex Technologies. Even from the early releases of this product, the benefits were immediately apparent to everyone close to the project at the time. Like the original GasSaver, bolt-on additions to boilers are still available. These fit on top of an existing boiler, are the same width as a regular combination boiler and provide a somewhat large and bulky addition to an existing appliance. The other option is an integral appliance, where the passive flue gas heat recovery device (PFGHRD) is built into the workings of the boiler, self-contained inside the boiler casing itself. Atag Heating Technology is one of a select number of boiler manufacturers that produces an integral model. Atag’s iC Economiser combination boiler incorporates a specially-designed PFGHRD which captures waste energy from the flue gases and reuses it to pre-heat the mains cold water supply within the boiler, saving fuel and money in the process. Such innovation in boiler technologies has enabled the benefits of passive flue gas heat recovery to be delivered in the neatest possible way, making them more attractive to installers and homeowners. The Atag iC range of combi boilers also come with a weather compensator as standard, which is also an option to meet the new ‘Boiler Plus’ regulations for next year. Modern boilers are up to their limit in terms of their efficiencies with the burning of gas. Heat recovery is the next advance in efficiency and savings for a customer. Hot flue gases that leave combination boilers are between 50°C and 70°C. Heat recovery systems reclaim heat from these gases and use that heat to warm incoming water, so less energy is used in providing hot water for the home. Older boilers produced these gases at 120–200°C. Even though the flue gases are reduced in temperature in modern boilers, making boilers more efficient in condensing mode, there is still leftover heat that can be captured and used to heat up mains cold water. Before these gases go outside, they go through a PFGHRD heat exchanger, where incoming mains water gets the benefit of the heat. In a short process of passing through the exchanger, incoming water rises from around 10°C to between 20-40°C. This water then passes through the combination boiler, where it is raised to the pre-set hot water temperature. However, because it is already raised in temperature, the amount of energy required to bring it to this pre-set hot water temperature is greatly reduced. This heat recovery process takes place inside a sealed box, meaning the component is maintenance free, and there are no moving parts for installers to check during a service. Manufacturers vary in their specification of heat recovery devices – Atag’s PFGHRD is 100% stainless steel. In installation terms, an add-on version needs the mains water pipework running up to it and back down to the supply of the combi boiler, which generally takes around an hour. 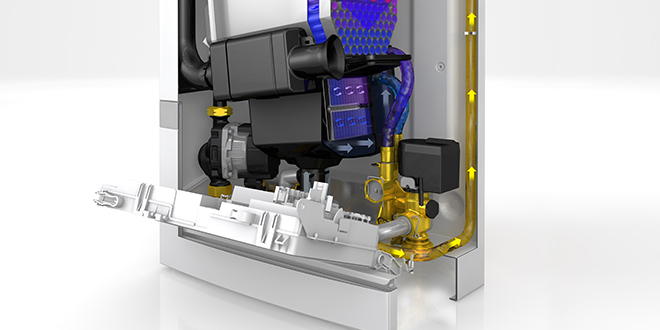 For an integral device, everything is built-in and installers pipe it up as they would any standard combi boiler. This is the next step forward in making already-efficient products even more efficient in the way they heat and produce hot water. How much can they save? With such easy installation and so many benefits in efficiencies and cost savings for end-users, it is surprising that more of these devices aren’t being installed. Independent tests presented to the Government concluded that if half a million heat recovery systems were installed in homes, 56,209,150m3 of gas would be saved and 114,734,118kg of carbon dioxide emissions saved. However, there are a few roadblocks preventing more installers adopting either integral or bolt-on passive flue gas heat recovery devices. Firstly, there is the ‘ugly’ nature of bolt-on devices. These external products literally sit on top of the boiler in a customer’s home, which can lead to a reluctance in an engineer recommending the installation. Then there is the cost implication. External devices can cost from £500 up to almost £800, depending on the type of boiler they are being attached to. The end-user does see savings, on average, of £40–£60 a year in the production of hot water. However, this would take many years to pay off the cost of the outlay on the heat recovery system. Integral systems mean that full efficiencies and savings will be packaged inside a single unit. Energy efficiency enhancement of boiler systems remains a hot topic across the heating industry, and we have reached the point where green credentials and aesthetics combine to present the most attractive proposition to both installers and homeowners. The current pressure on manufacturers to meet the ‘Boiler Plus’ standards means that, from next spring, installers and their customers will enjoy the full benefits of a modern heat recovery system. These energy efficiency drivers should see the era of heat recovery systems fully take off at last. The Johnson and Starley Quantec HR28C has passive flue gas heat recovery within a standard size boiler case , carries an 8 year warranty and was named in the recent WHICH report as the most reliable boiler they tested.